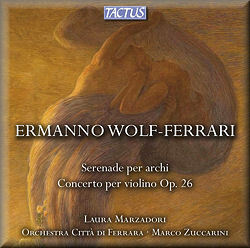 Ermanno Wolf-Ferrari’s Violin Concerto has been variously dated in various sources between 1901 (which it sounds like) and, by Grove’s Dictionary, as 1946. Albert Cantù’s otherwise interesting notes in Tactus’s booklet are not overly free with the dates of composition of either the Concerto or the companion Serenade, and have been strangely rendered into English. However for the record, the Concerto was completed in 1943 and premiered in Munich on 7 January 1944. Listening to this live performance of the Concerto one could be forgiven for experiencing one of those sleepy railway journeys where one’s eyes open briefly to focus on oddly familiar valleys, and then later again on familiar forests, and still later on vaguely reminiscent lakes: in this case the valleys, forests and lakes are Brahms, Bruch, Saint-Saëns and maybe, if extra topography is allowed, Vieuxtemps, Sibelius and Mozart. What a weird work it is. The opening rustling accompanying strings remind one of the opening of the Sibelius Concerto and the almost immediate entry of the soloist solidifies the impression. Thereafter there is one lovely and richly argued melodic statement after another, with structural points marked by classical rigour. There are strong hints of Bruch in the broken passagework and the melodic generosity. The Romanza probably began as a 16-minute homage to Mozart but Wolf-Ferrari sensibly halved its length and imbued it with a charming rococo feel and a pensive minor section, even a Richard Strauss moment of two – not inappropriate really as Wolf-Ferrari spent so much of his life in Munich. The third movement is a virtuosic Improvviso, reminiscent of stormy late-nineteenth century violin virtuosity. The finale is full of high spirits, and its quasi-operatic, almost buffo quality is strongly audible in this performance. Tchaikovsky is certainly recalled, Hubay and his confreres too – indeed Rossinian high jinx are never far away. This is, to be frank, one of the most inchoate concertos you will ever hear. It was dedicated to the young and intermittently brilliant – all too often erratic – Guila Bustabo, who left behind a recording of it with Rudolf Kempe, no less, in Munich which has been out on CD in a release dedicated to her. The elderly composer was clearly smitten by his mermaid muse and poured out a series of lovely, if stylistically ramshackle melodies for her. Laura Marzadori is about as young as Bustabo was when she premiered it in Munich in 1944 – though being American, Bustabo’s work in wartime Germany came back to haunt her. Marzadori plays with fire and commitment and good tone. The orchestra is well directed by Marco Zuccarini. There are noises off, but these are inevitable by-products of a concert performance. For a more clarity-conscious performance there is Ulf Hoelscher, in the studio with conductor Alun Francis, on CPO 999 271 with the same coupling as here or Benjamin Schmid on Farao 108069, which has just been released as well. I like both these fiddlers, though I’ve not heard Schmid’s very recent recording. Hoelscher is more expressive than Marzadori in the slow movement and is more incisive in the opening. His recording is less problematic as to the corollaries of a live performance but the young Italian’s performance reveals a real talent and a sure touch for the idiom. The 1894 Serenade is an attractive early work, very light-hearted and genially warm. Mendelssohn and Rheinberger are the models – the latter especially in the fugal finale. Wolf-Ferrari’s care over oppositional string writing is charmingly evident. Whilst I feel the finale could have profitably been tauter, Zuccarini and his forces project its high spirits extremely well.